The Donald went to Detroit to deliver a major economic policy speech. Scripted Donald is much more palatable than the ranting and raving alternative and policy substance is always appreciated ... but per ush ... he spend the better part of an hour lying to the American people. But fear not friends! 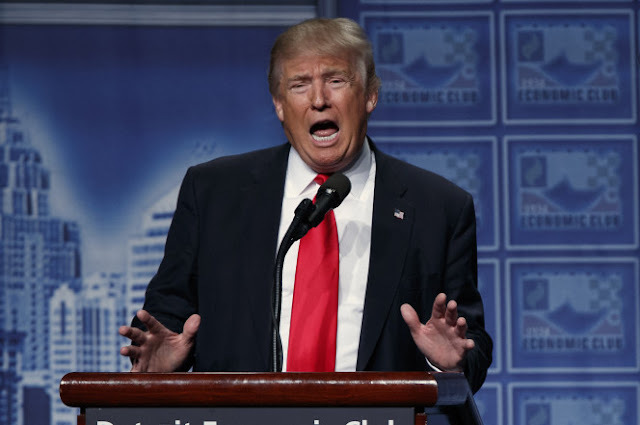 Washington Post fact-checkers Glenn Kessler and Michelle Ye Hee Lee rebutted Republican presidential nominee Donald Trump’s “pathetic, even embarrassing” falsehoods in real time as Trump gave an address before the Detroit Economic Club. Note to @realDonaldTrump: Just because you have footnotes doesn't mean the facts are correct. We certainly enjoyed. Looks like The Donald pissed off the wrong journalists.